Peggy Owens (left in photo), an employee of CE National and a member of the Winona Lake (IN) Grace Brethren church (Bruce Barlow, lead pastor) was honored this week as one of the recipients of a 2008 Heart of Gold Award. Recipients were honored at a reception, presented by Kosciusko County Community Foundation Inc., was held at Center Lake Pavilion in Warsaw, Indiana. Recipients are recommended by community members who nominate them. Ten nominees, including Peggy, were selected by Kosciusko County Community Foundation volunteers to have their stories highlighted during the reception. Recipients were selected based on their service to others, identifying a need and fulfilling it, working to create positive change and inspiring others to volunteer. “The purpose of the award is to celebrate ordinary citizens who serve others in extraordinary ways,” said Kosciusko County Community Foundation Executive Director Suzie Light. Each person nominated for a Heart of Gold award received a Heart of Gold pin, a certificate and the opportunity to recommend a Community Foundation grant to the area charity of their choice. Marsha Cook and Tracy Jackson read the nominees’ and nominators’ names and highlighted the stories of 10 nominees, including Peggy Owens, for her volunteering at the Kosciusko County Jail for the past nine years bringing her joy of music with her keyboard on Sunday mornings and Monday evenings. 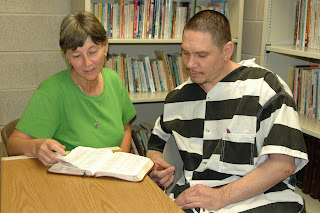 She also teaches a Bible study to female inmates.